A gold dust day gecko in Kihei, Hawaii. Sometimes, technical problems are just a bug. Other times, it’s a lizard. Earlier this week, the director of a seal hospital in Hawaii says she was deluged with a more than a dozen mysterious calls to her cell phone. When she picked up, however, the line was silent. To make the situation even stranger, the calls were apparently coming from inside the hospital. Simeone says that Hawaiian Telecom, the center’s phone company, confirmed that “a bazillion calls” were indeed coming from a single line inside the hospital and asked her to look around to find the problem phone. 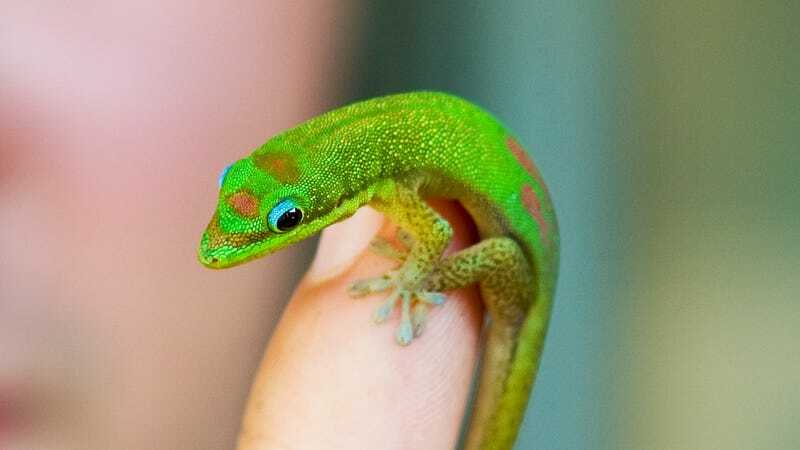 When she finally found it, however, the issue wasn’t hardware or software, but footwear—that is, the toe pads on a tiny gold dust day gecko. In the end, Simeone says she sent a note to the center’s staff and volunteers about the flood of strange “telemarketing calls” made by one foot-dialing lizard. The gecko, it should be noted, wasn’t a patient at the hospital, but one of the sticky-toed interlopers that regularly sneak indoors looking for bugs in Hawaii. A fact that apparently wasn’t lost on the Hawaiian Telecom employee.